Feel the need for some speed? 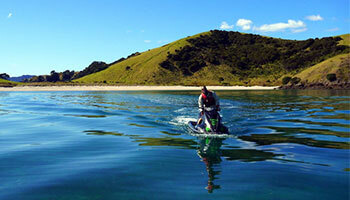 A Jet Ski is a exciting way to get the adrenalin pumping while touring the stunning Bay of Islands. Not only do you get to take in the magnificent vistas, you also get the thrill of riding your own Jet Ski. Choose from a guided tour or simply hire a Jet Ski and create your own itinerary. Try island hopping or blasting through the famous Hole in the Rock, then take a rest on a secluded island beach.